A man in the US state of Texas has been arrested for allegedly trying to cash a cheque for $360bn (Â£182bn). Charles Ray Fuller had said he wanted to start a record business, authorities in the state said. The 21-year-old’s attempt to cash the money in a bank in Fort Worth failed when staff spotted the 10 zeros on the personal cheque. Mr Fuller was arrested on a charge of forgery and was released on bail of $3,750 (Â£1,900). 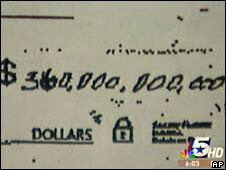 The man from North Texas said he had been given the cheque by his girlfriend’s mother. The bank said it had contacted the account owner and had been told she had not given Mr Fuller permission to either take or cash the cheque. Fort Worth police said Mr Fuller also faced charges of unlawfully carrying a weapon and possessing cannabis. Officers said a small amount of cannabis and a .25-calibre pistol were found in his pocket. In October last year a man in the city of Pittsburgh was arrested after he handed over a counterfeit $1m bill to a cashier at a supermarket and asked for change. Three years earlier a woman was arrested after trying to use a fake $1m bill at a supermarket in Georgia. Hmmm….. Bill gates (The richest man on the planet), only has 40 Billion ! Why did he think he was 10 times richer than him? Answer: pure stupidity. Just goes to show you that a quality high school education is worth more than you think . Pleeeease dont let this man breed !! You think thats bad? a man got arrested for trying to pay $32 at a hotel… whats wrong with that? he tried to pay with 2 16 dollar bills….